Back in September Eldest Mudlet gave me a copy of ‘Mary Berry 100 Cakes and Bakes‘ and I resolved to try and make every recipe in the book because they all look scrumptious and I love cakes. So the other day, I thumbed through the book trying to decide which of these gorgeous bakes I wanted to have a go at. After much deliberation and taking into account what ingredients I had to hand, I settled on the Coffee Fudge Squares. The method for this particular tray bake involved putting all the ingredients into a bowl and beating them well for two minutes or until the ingredients had combined. Having ever only used the ‘cream butter and sugar then add eggs and beat one at a time‘ method before, I was a little dubious about how well this ‘all in together‘ method would work. As it turned out, I was pleasantly surprised to see just how readily the batter came together. It was quite a stiff mix but I was able to level it off in my cake tin and popped it into the oven for around 30-40 minutes. When I finally took the cake tin back out of the oven, the cake itself was very level (usually my cakes and tray bakes have a gentle mound in the center) and I did wonder if this would mean that the texture would prove heavy, or if I had done something wrong. 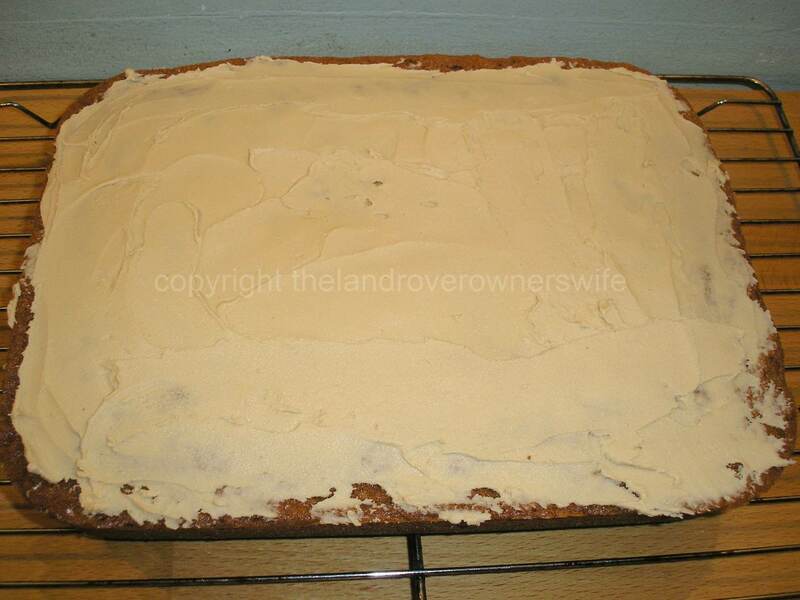 The instructions in the book were to allow the cake to cool down in the tin and so I had to wait before I could get a look and feel for the texture and in the mean time, not having all the ingredients to make the coffee fudge topping, I made some coffee butter icing instead. Finally I was able to take the cake out of the tin and I could hear the lovely hollow sound I associate with a nicely baked cake or bun, when I tapped the base. With the icing applied, I cut the cake into squares which did indeed reveal the lovely open texture of what turned out to be a delicious cake. Mary Berry recipe number 1 (actually it’s probably nearer recipe number 50) … only 99 more to go. Categories: .... on home baking | Tags: cakes and bakes, coffee cake, Food, Home baking, Mary Berry | Permalink. Mmmmm…… coffee cake is my favourite but sadly no one else in the house will eat it, consequently I only make it occasionally! This looks scrummy.